George Mottershead founded the Chester Zoo in the early 1930. This mammoth zoo covers an area of over 100 acres within a total land holding of over 400 acres. The Chester Zoo was a successor to an earlier failed venture of developing a small zoo at Shavington, Cheshire-the hometown of Mottershead. The Chester Zoo situated in Cheshire, houses more than seven thousand animals representing over five hundred species and records visitor's attendance of above a million per year. The admission charges range from ?7.50 to ?39.50. The Zoo is internationally acclaimed for its scientific enclosure designs and high rate of breeding successes. 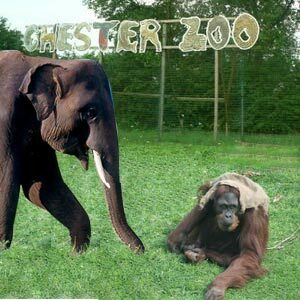 Chester Zoo, considered to be one of Europe's finest zoos has an exceptional track record for housing endangered animals and breeding them in their natural habitats. The Chester Zoo plays a pivotal role in wild life conservation programs with conservation breeding, public education and research. A few of Chester zoo's prominent projects are support of Black Rhino anti-poaching activities in East Africa and the conservation of wildlife in the Forest Reserves of China. Moreover the Chester Zoo staff and associates have been involved in pursuing in-house research in varied domains like animal behavior, animal health and genetics, conservation, reproduction etc. Some of Chester Zoo's new inmates are the endangered Bears of Cloud Forest, Miniature Monkeys, Red River Hogs and Macaw Forest Zone. The Chester Zoo has clear signs and large maps located all across the area making for a comfortable visitor experience. The Chester Zoo's Oakfield Manor House provides a perfect setting for conducting civil weddings. The manor is exquisite and provides a delightful view of the 100-acre zoological garden. This dainty manor in the Chester zoo can accommodate a maximum of 120 guests and make the whole wedding experience once in a lifetime affair.